I purchased a Rachio 3. I have a Rain bird EPS controller currently. My current wiring is shown in the attached picture. I have 8 zones. From the picture, terminal 1 and 2 have two wires connected. Terminal 2 does not. I have read that you can connect two zones to one, but wanted to make sure before I connect my Rachio (I plan on putting 1 and 2 on their own connections). The upper left shows the sensor connection jumpered between the two sensor terminals. 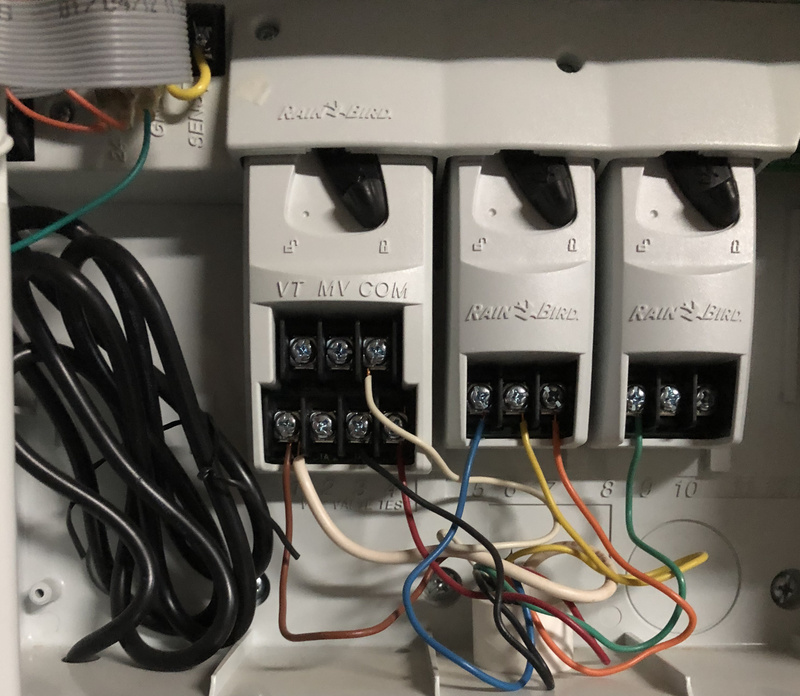 I don’t have a sensor that I’m aware of, so I’m guessing that along with the DC connections in the upper left of the picture aren’t required for my Rachio rewiring. Any clarification would be greatly appreciate. Rachio states they can support three (3) solenoids running at one time. If one has a Master Valve and turns on the Reduce Water Hammer Option that would be three valves - Master Valve, previous zone valve and current zone valve. There doesn’t appear to be a Master Valve in use in the picture above. The Rachio power supply supplies 1 Amp (1,000 milliamps) of current and the brown out circuitry is the actual limiting factor to the amount of power/number of solenoids being used. Yes, multiple wires/solenoids can be on one zone. However, that zone will need to be configured sub-optimally for the most water needy section. If each zone is one solenoid and the zone is mainly the same water needs, then Rachio can water to those specifications - especially if a Flex schedule is used. Correct, ignore the wire in the SENS and the power connections in the upper left hand corner. Welcome to the community, let us know if you have any additional questions. Thank you for the quick response. So, to clarify, I should be able to do a 1 to 1 wiring connection of my current setup (shown in the picture I attached). I planned on separating 1 and 2 into their own connections on my Rachio 3. Black to three, … green to eight. Rachio power supply plug for power. Perfect. Thank you. I’ll probably post “how it goes” when I’m done.